Join Miss Lady Lace’s Pinup Academy for a collection of vintage dance classes every Tuesday night. Gain confidence, fitness and have fabulous fun. No experience is required and all classes are casual so they’re designed for the lady with a busy lifestyle, and are drop in, as opposed to committing to attending every week. This class is will include a stretch sequence taught each week, as well as theory behind burlesque history and the business of burlesque. Solo student will also have opportunities to test their new acts in front of the class. Discussions will encourage growth for performers. This is a free class, and everyone is welcome even if you’d just like to come along for fun. Each week learn a new glamorous vintage dance or pinup, such classes as burlesque dancing, pinup posing, confidence, showgirl, and many others are regularly featured. TERM January 8th – April 16th. Level of experience: this class is suited for all levels of, it will be catered to suit beginners but will also teach technique to benefit higher levels too. Date and Time: Every Tuesday night from 6:30pm – 9pm until December 11th. Price: $20 per person, attend both classes for $35, or buy a 6 Class Pass for $90! Bookings: either just come along on the night with cash, or email contact@ladylace.com.au to book in advance. What to wear and bring: Please bring with your cash for this event, and a drink bottle. Wear dance appropriate clothing (comfortable top, dance pants) and a pair of heels you can dance in if you feel confident. You’ll also need cash to pay for the class. 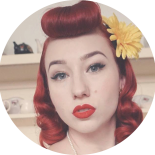 About Miss Lady Lace: Miss Lady Lace is a professional pinup girl, burlesque artist with over 8 years of professional experience, with her biggest passions being sharing what she loves through teaching others and hosting wonderful retro events.